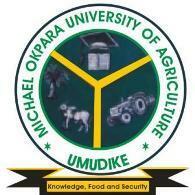 This is to inform all the candidates that applied admission into the Michael Okpara University of Agriculture, Umudike (MOUAU) full-time/part-time Post-Graduate Diploma (PGD) , Masters (MSc) and Doctorate (PHD) programmes that they can now check their admission status online. How to Check MOUAU Postgraduate Admission List. Congratulations to all the candidates that made it to MOUAU postgraduate admission list for the 2018/2019 academic session.